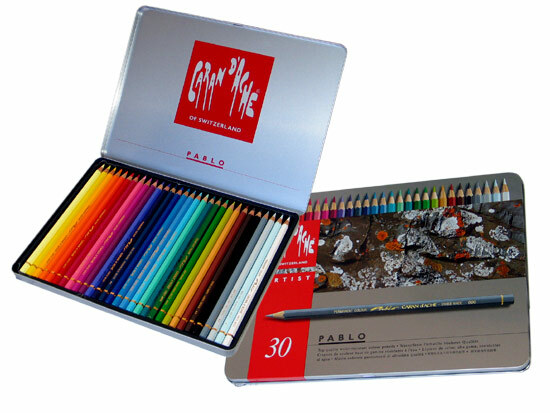 The water-resistant colour pencils Superior colour pencils for highest requirements: artists, illustrators, graphic art, art tuition. • Lead: soft water-resistant leads, Ø 3.7 mm, very economical thanks to their exceptional covering power, excellent lightfastness. • Shaft: hexagonal, end-sealed in the same colour as the lead, marked with colour name and code, best cedar. • Product conforms to CE EN71. • Techniques: shading, graded applications, mixed media, can be combined with Supracolor Aquarelle and Neocolor crayons. Drawing on wood, photographs. Also available in a wooden box set. I was very curious to try these pencils by Caran d'Ache and they didn't dissappoint me. Coloured pencils are my favourite material to work with. I tried many brands, among which some of them were really good, and I can say that these are the best. I am truly impressed by the blending performance of Caran d'Ache's Pablo pencils. The finish is bright, lead quality is superb, and no mass whatsoever. I tested the water resistancy as well, impressive performance again.